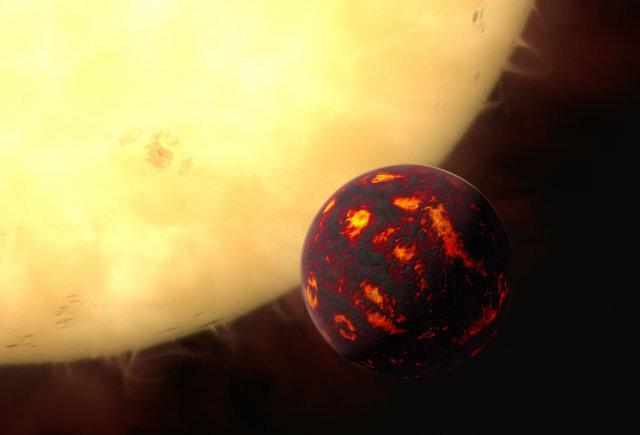 An article published in the journal “The Astrophysical Journal” describes a research on the planet 55 Cancri e focused in particular on its atmosphere. This is the first study of its kind involving a super-Earth and was carried out in an innovative way using the Hubble Space Telescope. 55 Cancri e has already been the subject of several studies and about four years ago was the first super-Earth directly observed. 55 Cancri e is an exoplanet out of the ordinary for various reasons. It’s very dense so its size is twice the Earth’s but its mass is eight times greater. Its orbit is very close to its star, meaning that its year lasts only 18 hours and its rotation is synchronous so its day lasts as much as its year. It’s estimated that temperatures on its surface can exceed 2,000° Celsius (3,600° Fahrenheit). Thanks to the vicinity of 55 Cancri e to its parent star, the planet light’s spectrum left huge traces in the star’s light. As a result, it was possible to use a new analysis technique to extract those traces from the observations carried out with the Hubble Space Telescope’s WFC3 (Wide Field Camera 3) camera. The result is that the researchers were able to identify the gases in the atmosphere of 55 Cancri e. They’re mostly hydrogen and helium, of which the planet retained a significant amount from the gas nebula it formed from, while water vapor wasn’t detected. There are also traces of hydrogen cyanide, a compound highly toxic to us which can be found in carbon-rich and with a high carbon/oxygen ratio atmospheres. If this gets confirmed by further research, it will be more evidence of the presence of carbon not only in the atmosphere, a feature at the basis of the hypothesis that this planet’s inner part was composed of a giant diamond. The planet 55 Cancri e is often used for testing new types of research, in this case on the atmosphere of super-Earths. It’s a type of research that helps understand more about the formation and evolution of these planets. On this planet, the atmosphere also seems to have remained more or less unchanged since its formation, in other cases there may have been significant changes and if they were associated with biological activities that would be a historic discovery. The Hubble Space Telescope is an extraordinary instrument and yet there’s so much it can achieve in studying super-Earths. However, today’s research are also useful to define the best methods to study them. The next generation of space telescopes will allow much better observations of these planets and their atmospheres.